Discover the critical first steps you must take to clarify your career direction. 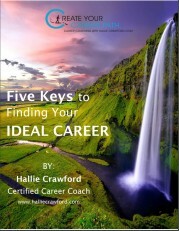 This e-book was created to help you begin the process of finding your ideal career. Learn how to begin your career search in the most effective way possible to define your direction, overcome obstacles and master the first five keys you need to unlock the door establish the right foundation for your career direction. This 26-page e-book walks you through the first five exercises we use with all of our clients and provides tools that will motivate and guide you towards finding a career you are passionate about. Don’t settle for less than a job you truly enjoy! Client success stories to inspire you toward your career dreams.